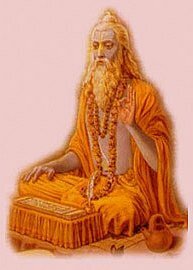 Did Hinduism discovered theorem of Pythagoras? Vedic mathematics were the first and foremost source of knowledge . Selflessly shared by ‪‎Hindus‬ to all around the ‪world‬. The Hindu FAQs Will now answer some discoveries around the world which may have existed in vedic hindusim. And as i always say, We wont judge, We will just write the article, its you who should know whether to accept it or reject it. We Need open mind to read this article. Read and learn about our unbelievable history . It will blow your mind ! ! ! Well It is also claimed that Babylonians knew and used the rule of the right triangle Long before Bauhayana and Pythagoras. It is also claimet to be developed sometime before Euclid, and it’s displayed very well in Euclid’s Elements. Some claime that it was chinese who discovered it before anyone else. Well I wont go with who discovere it first, Rather i would explain Bauhayana’s Theory as our website is to know about hinduism, and not to prove how to hinduism is greatest of all. So, Baudhayana, (800 BCE) was the author of the Baudhayana sutras, which cover dharma, daily ritual, mathematics, etc. He belongs to the Yajurveda school, and is older than the other sutra author Apastamba. He was the author of the earliest Sulba Sutra appendices to the Vedas giving rules for the construction of altars called the Baudhayana Sulbasutra. These are notable from the point of view of mathematics, for containing several important mathematical results, including giving a value of pi to some degree of precision, and stating a version of what is now known as the Pythagorean theorem. Sequences associated with primitive Pythagorean triples have been named Baudhayana sequences. These sequences have been used in cryptography as random sequences and for the generation of keys. The square of the hypotenuse of a right-angled triangle equals to the sum of the square of the other two sides. “The area produced by the diagonal of a rectangle is equal to the sum of area produced by it on two sides. 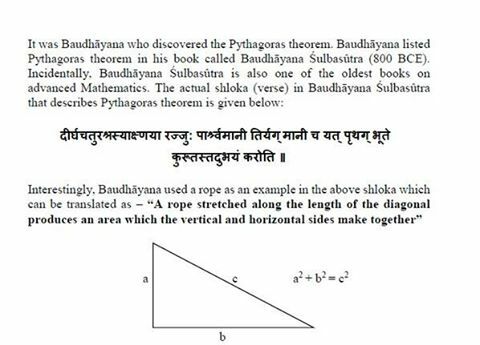 Interestingly, Baudhayana used a rope as an example in the above shloka which can be translated as – A rope stretched along the length of the diagonal produces an area which the vertical and horizontal sides make together. As you see, it becomes clear that this is perhaps the most intuitive way of understanding and visualizing Pythagoras theorem (and geometry in general) and Baudhāyana seems to have simplified the process of learning by encapsulating the mathematical result in a simple shloka in a layman’s language. The implications of the above statement are profound because it is directly translated into Pythagorean Theorem and it becomes evident that Baudhayana proved Pythagoras theorem. Since most of the later proofs are geometrical in nature, the Sulba Sutra’s numerical proof was unfortunately ignored. Though, Baudhayana was not the only Indian mathematician to have provided Pythagorean triplets and proof. Apastamba also provided the proof for Pythagoras theorem, which again is numerical in nature but again unfortunately this vital contribution has been ignored and Pythagoras was wrongly credited by Cicero and early Greek mathematicians for this theorem. Baudhayana also presented geometrical proof using isosceles triangles so, to be more accurate, we attribute the geometrical proof to Baudhayana and numerical (using number theory and area computation) proof to Apastamba. Also, another ancient Indian mathematician called Bhaskara later provided a unique geometrical proof as well as numerical which is known for the fact that it’s truly generalized and works for all sorts of triangles and is not incongruent (not just isosceles as in some older proofs). The diagonal [lit. "doubler”] of a square. The measure is to be increased by a third and by a fourth decreased by the 34th. That is its diagonal approximately. The diagonal [l[lit. "doubler”]f a square. The measure is to be increased by a third and by a fourth decreased by the 34th. That is its diagonal approximately.